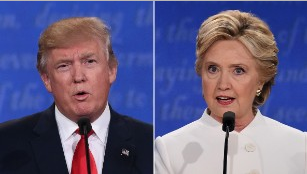 The third presidential debate, which is widely considered to have been the most substantial discussion of policy, occurred in Las Vegas last night. The most talked about moment didn't come when Hillary was asked about the DNC coordinated effort to incite violence at Trump rallies. It didn't come from the increased number of alleged Trump's sexual assault victims coming forward. It also didn't come from allegations of quid pro quo during Hillary's time as Secretary of State. It came with Trump's "I will keep you in suspense" response to Chris Wallace when he asked Donald if he would accept the election results if he lost. Pundits on the left said it should disqualify him from the presidency while Kellyanne Conway, Mike Huckabee, Rudy Giuliani and others on the right were comparing the situation to Al Gore's call for recounts in the 2000 election. Also, our contributions to the Christian Science Monitor continue this week with The Politics of US: Immigration. Use the AllSides topics page on immigration for background, news and dialogs, and check out our new school lesson plan for immigration, our latest addition to AllSides for Schools. "Over the course of his improbably successful presidential campaign, Trump has often given the impression that he’s playing with fire: that he is invoking deep anxieties about cultural change, fear of nonwhite Americans, and a belief that society is fundamentally broken, without understanding that those sentiments are too powerful for him or anyone else to control. Now he’s opening doors that should never be opened — inviting his followers to trust him (and their own instincts) more than they trust democracy itself, and to outright challenge the outcome of the election if it doesn’t go his way. ...Trump has been accused of emboldening a whole spectrum of hate: everything from organized white supremacy, to schoolyard taunts, to violent hate crimes. He hasn’t necessarily inspired feelings that weren’t already there. But he’s allowed people to voice and act on them publicly and not feel ashamed." "Despite again communicating in his patented sentence-fragment-sprinkled word salad, I think he probably battled Clinton to an approximate draw for most of the debate. The big exception was the 'fitness for office' stretch. She clearly won that exchange, and his decision to repeatedly equivocate on accepting the electoral outcome in November (the 'leave you in suspense' line felt flat and felt cheap) will dominate a lot of the coverage for the next few days. ....I'd guess the American people want to hear their candidates promise to honor the process. Even Trump loyalists like Laura Ingraham quickly conceded this point." "Donald Trump on Wednesday refused to say he would accept the result of the presidential election if he loses to Hillary Clinton, raising the possibility of an extraordinary departure from principles that have underpinned American democracy for more than two centuries. 'I will look at it at the time,' Trump said when asked during the final presidential debate whether he would concede if he loses on November 8, following his claims that the election is "rigged" against him. He added: 'I will keep you in suspense.'"